Tension headaches can make sufferers feel terribly, horribly, awfully miserable. But the good news is they are often very treatable. But how do you know if what you’re suffering from is a tension headache when there are so many ‘varieties’ of headaches around? 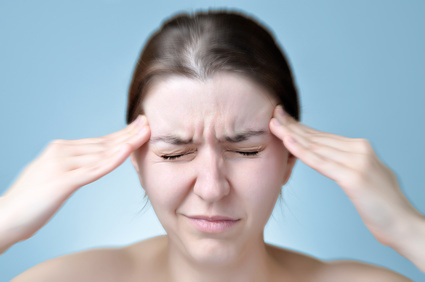 Headaches are usually categorised into two groups: tension headaches and migraines. Migraines are the more extreme, sinister type; however, tension headaches can still be overwhelmingly bad. And incidentally, there can be hybrid headaches that have characteristics of both types. Migraines have origins that are much more complex than tension headaches, which are mainly caused by muscle pain and tension. Tension headache symptoms include pains that radiate all over your head, feelings of tightness and pressure, and for some, pains can manifest in your neck and shoulders – or possibly even arms. Before we discuss treatment and prevention of tension headaches, though, there are some headaches caused by other factors, some being quite sinister, that we all should be aware of. So let’s tick those off the list now. Concussion – usually caused by trauma to the head, concussion changes the way your brain functions. Effects are usually temporary. Problems, along with headache, include issues with concentration, coordination, balance and memory. Medical problem – sinusitis, blood clots in the brain (different from stroke), congenital heart disease, glaucoma, encephalitis (brain inflammation), influenza, hangovers, ear infections, toxoplasmosis, panic attacks, intracranial haematoma (blood vessel ruptures in the brain) and many, many other medical problems can cause headaches. Lifestyle factors – some headaches can be triggered by processed meats that contain nitrates, red wine or other types of alcohol. Stress, skipped meals, dehydration, loud noise or poor posture can also be contributing factors. Brain tumour – can be benign or malignant. They cause pain and headaches because they take up space in the brain. First symptoms usually include headaches and possible fits. Individuals experiencing the symptoms should seek immediate medical attention. However, it’s important to remember that brain tumours are rare and there may be other reasons for the symptoms. Muscle tension causing these headaches can come from various places, but often they can come from the suboccipital muscles at the base of our skull. Fortunately, for many, learning about these muscles and how to self-massage can be a game changer in tension headache treatment. Lying with the base of your skull propped up against a foam roller, gently massaging the area by tilting the head from side to side, or having someone gently massage the suboccipital area can often bring almost immediate tension headache relief for sufferers. The trapezius muscle, the large muscle that sits on top of the shoulder and extends up into the neck is often a strong tension headache contributor, so it is worth checking for trigger points and doing some gentle massage in this area as well. The temporalis muscle, a jaw muscle that sits over our temples is often a source of pain and can be tight due to other muscles contracting. And, while you’re in that area, the masseter muscle should also be massaged as it also a common source of tension and pain. Other muscles to address to aid in the treatment for tension headaches include the columns of muscles on either side of your neck (cervical vertebrae), the scalene muscles and the upper back. Yes, there are things you can do to get you out of your miserable cycle of tension headaches and to provide short-term, symptomatic relief. Sometimes, a multifaceted approach is required for lasting effects. Wear a telephone headset – If you’re on the phone for more than 15 minutes a day, go out and buy a head set. The difference may be life changing. Your neck – and your relieved head – will never stop thanking you. Convert to dictation software – If you use the computer a lot, think seriously about converting to dictation software. Once only a modality for the disabled, dictation software has come a long, long way. Not only will you be much more productive when you work (speaking is far faster than typing) but many of your aches and pains will disappear. Check your office ergonomics – Make sure your monitor, keyboard and mouse are all placed appropriately and are not causing you to repeatedly stretch, strain or reach for things, and that you don’t have to unnecessarily twist or tilt your head. Have your eyes tested – Is your eyewear up-to-date? It’s so easy to forget about check-ups, but updating your eyewear could make a big difference. Also, if you’re wearing bifocals or trifocals, you may find yourself tilting your head back to see the screen. This will cause your suboccipital muscles at the back of the head to contract and possibly be a cause of your tension headaches. Check your posture – your postural alignment will have a major effect on muscle stress and pain, particularly for those that lean over a computer each day. Check your posture, and make sure you take regular breaks from your computer work. Stretching and exercising – often sufferers of tension headaches respond well to stress relief, changing mental states, movement and generally blowing off steam. Mobilisation – learn how to release the muscles of the jaw, neck and shoulders by gently stretching and moving muscles in this area regularly. Self-massage – addressing the muscles outlined earlier in this article through massage with your hand, foam roller or spiky ball can be extremely beneficial for those suffering from tension headache.